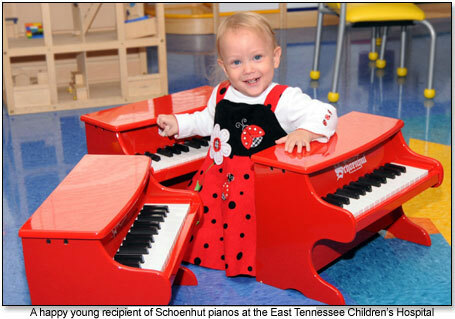 Our introduction to Schoenhut® toy pianos in 1996 was a case of love at first sight. Since beginning operation of the company at that time, the thrill of designing, manufacturing, and marketing these intriguing instruments has not wavered. Along with many of the original designs that Albert Schoenhut, founder of the company, created in 1872, additional styles and colors are offered each year. Unusual in the manufacture of new products in the toy industry, all prototypes are designed and hand-built by my husband, Len Trinca. Although Albert designed musical instruments with children in mind, we are delighted that many professional musicians regard Schoenhut toy pianos as serious concert instruments. John Cage was pivotal in piquing interest by composing "Suite for Toy Piano" in 1948. This skyrocketing trend gives a new perspective about Schoenhut, attesting to the exceptional quality of the company's products. A number of musicians who have dedicated their careers to toy pianos (composing, teaching, and performing) are featured on the Schoenhut Artist Roster. Owning the company has served as an introduction to a population we would not ordinarily have encountered... people whose lives have been positively affected as a result of playing an instrument. It is also a pleasure to meet toy piano fans at trade shows, concerts, media events, and during tours of the Schoenhut factory. As business owners, we are committed to giving back to the community that supports us. Through contributions to selected organizations each year, Schoenhut gives the gift of music to children in need who might not otherwise have a musical instrument. 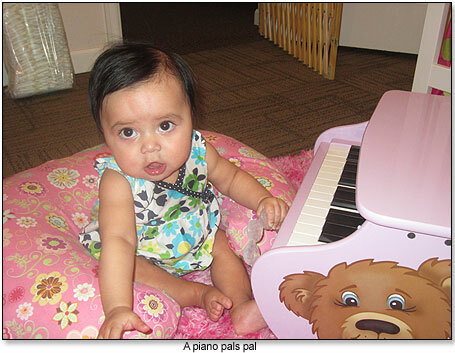 One such example is the company's donation of 100 toy pianos for TDmonthly's Charitable Kid contest in 2010 as well as the 200 instruments we are giving away as part of TDmonthly's "2012: A Year of Charity" promotion. Yearly donations are given to The Toy Bank sponsored by Toy Industry Foundation (TIF) and Summer Gift Drive by Gifts in Kind. We also support TIF's Do Good Stuff-a-Thon. Locally, here in St. Augustine, Schoenhut musical instruments are donated to churches and schools, with special emphasis on bringing happiness to impoverished and special needs children. 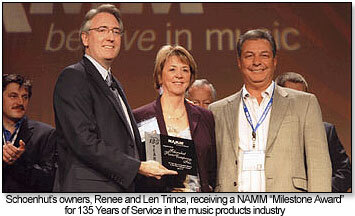 We are proud of our reputation for musical instruments of superior quality at affordable prices, all having passed stringent tests for safety, along with a promise of 100% customer satisfaction. Schoenhut vintage models are in use today, after being passed down from generation to generation. A Schoenhut toy piano is truly a gift that lasts a lifetime (and more!). Schoenhut's beautiful Pineapple Ukulele with four nylon strings provides clear, authentic Hawaiian tones. The innovative design incorporating a molded composite body with dual curves greatly enhances sound and durability. A birch soundboard which offers excellent tone and resonance, hardwood neck (for rigidity), and molded composite fretboard ensure proper height and spacing of the frets. Available in several vibrant designs. Includes: Pick & Extra String. Schoenhut's three-octave Traditional Deluxe Spinet, with a keyboard almost half the size of an adult piano, is designed for the three-to-nine-year-old. The span of the keyboard allows room for playing with both hands. The standard key width promotes proper finger placement, enabling an easy transition to a larger piano. Chime-like notes, the unique sound for which Schoenhut is famous, are produced by small hammers striking steel music rods. Available in Black, White, Mahogany/Black. Includes bench, Schoenhut's Learning System, songbook and a color-coded strip that fits behind the keys to guide small fingers from chord to chord. Kids can celebrate the magic of music with this handcrafted guitar that can be used for guitar classes, private lessons and study, or for play in a child's first “amateur band.” A quality instrument is always beneficial when beginning the study of music, especially when the student is young. "This guitar is easy to play, tunable, and will help to keep a child pursuing one of the most rewarding pastimes in history: making music," Manager Kristy Schaffer of Schoenhut told TDmonthly. Launch date: December 2008. Kids can play simple tunes on this durable, wooden instrument by just covering different holes to play various notes. It's an excellent instrument to add to a child's band. Launch date: October 2008. At 27 inches high, this wooden, lightweight instrument is designed with curved sides with a spacious box, along with a range of 15 notes (from C to C), permitting a wide variety of music in melodic tones. Fully tunable by using the wrench to adjust zither pins. 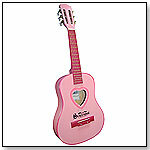 The perfect instrument for a JUNIOR ROCK STAR. Delivers great sound and incorporates many of the same features as a full-sized professional drum set. Built to last, constructed of high-quality hardwood shells and sturdy chrome-plated steel hardware. 8” Mounted Tom Drum & 10" Mounted Snare Drum, tunable w/ precision, adjustable, double-braced mounting arm 16” Bass Drum, tunable w/ two stabilizers for adjustable angle 10" Crash/Ride Cymbal, tunable, adjustable, Bass Drum Pedal, adjustable spring action Assembly required. Includes: Easy set-up instructions w/ illustrations, adjustable padded foam seat, tuning key, drum sticks. 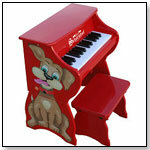 Schoenhut's bright red, wooden, 25-key tabletop is the perfect choice for a toddler's first piano. Both fun and educational, it is an ideal instrument for developing eye-hand coordination and encouraging musical creativity. Chromatically tuned, the lovely chimelike notes are produced by little hammers striking precision-ground, German steel music rods. The tone never changes nor will the piano ever need tuning. 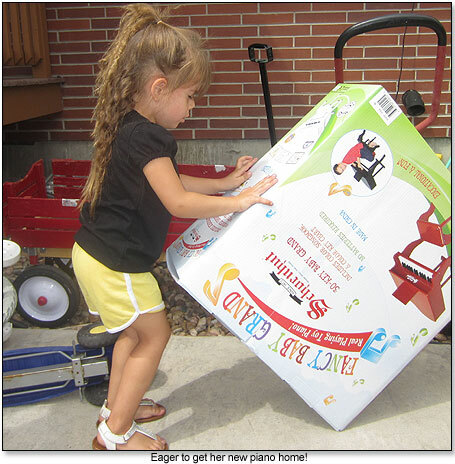 Schoenhut's patented Learning System, with its play-by-color teaching method, makes playing simple and fun. A removable color strip fits behind the keys to guide small fingers from chord to chord. The chart also works on adult keyboards, since keys on Schoenhut toy pianos are of corresponding width. This teaches children proper finger placement from the very beginning. The accompanying Songbook contains a collection of familiar tunes. 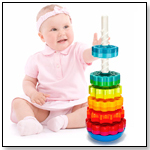 This Learning System has been specially designed to build a child's confidence and develop basic playing skills. It comes in red and white. Launch date: 2005. 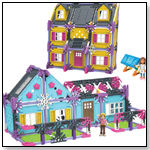 - This model was Schoenhut's best seller for 2010. It was also the model given away by TDmonthly's Charitable Kid, Kimberly (then 14) of South Carolina -- 100 times over! 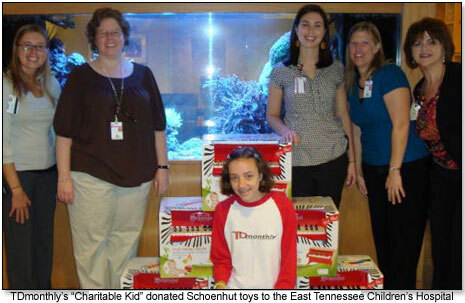 As a reward for her charity and careful selection of institutions to receive the toy pianos, Kimberly was given a number of other high-quality Schoenhut instruments, many of which she shared with her younger sisters. · Watch a Heartwarming Charity Giveaway!